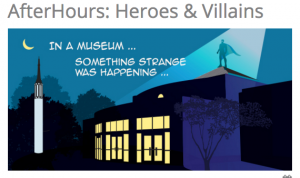 Recently, North Carolina’s Museum of Life and Science hosted an event called Heroes vs. Villains. DIBS was present, and folks from the Huettel Lab helped out. Going with the Heroes vs. Villains theme, folks from DIBS performed a social coordination task where people could work together or compete with each other to earn more rewards. As a bit of fun, a Good and Evil personality scale was also used. Check out some pictures here. Lawrence Ngo’s recent paper, Two Distinct Moral Mechanisms for Ascribing and Denying Intentionality, was featured in Fortune. Check out the article from Fortune above. Congratulations Lawrence! Congratulations to former Huettel Lab member Lawrence Ngo on his new publication, which was featured in Duke Today! Check out the Duke Today article above, or read the full text Two Distinct Moral Mechanisms for Ascribing and Denying Intentionality!